SCMA has been diligent in Data Security and being compliant with US and other Nations regulations. 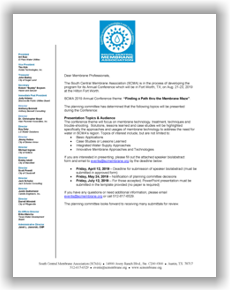 Students must have attended a basic water class or equivalent or be working as an employee of a Water/Wastewater Public Agency, Industrial Water/Wastewater Users, or Water Suppliers to End Users (submit proof). The registration fee includes CEUs/PDHs and the shipment of the MOC Manual to the address listed above upon receipt of payment. If an alternate address for shipment is requested, please provide the preferred shipment address below or by calling SCMA at 512-617-6529. If payment is not received within five (5) business days of the school, the MOC Manual will be provided the first day of class and upon receipt of payment. Non-Members - contact SCMA to become a member prior to registering for this Training or click here to apply for membership now. If paying by check, make payable to: South Central Membrane Association, and mail to: 14900 Avery Ranch Blvd., Suite C200 #300, Austin, TX 78717. Written cancellation requests received by the South Central Membrane Association (SCMA) at least 14 days before a scheduled event will receive a refund, less a $50 administrative processing fee upon return receipt to SCMA office of the unaltered MOC Handbook for each Module. Without return receipt of the unaltered MOC Handbook(s) the cancellation fee will be $200 for each Module (includes administrative processing fee and handbook fee). Full payment is required if the request is received less than 14 days of the scheduled event and no refund will be available. A substitution of the registrant may be made any time without cost up to the date of the event. The requested amount of a refund must exceed their respective administrative processing fees as described above in order to be considered. SCMA reserves the right to make changes to the scheduled event including but not limited to changing the event location, scheduled date(s), program and speakers, or to cancel the event in its entirety when conditions beyond its control prevail. If the event is cancelled, SCMA’s liability is limited to providing a full refund of the fees paid toward the scheduled event.